Casting for Game of Thrones extras in Osuna began today. 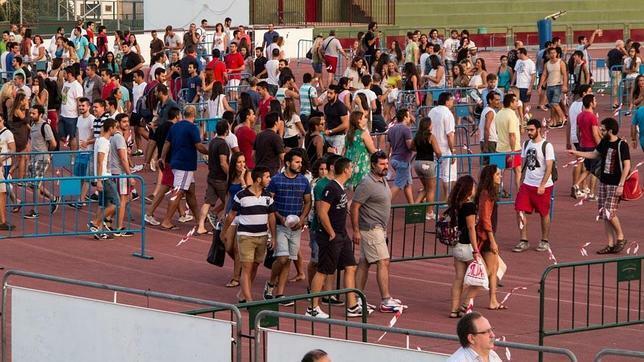 Over 2,000 people were in line by the time doors opened at 8AM at the casting venue, Raúl Carroza stadium. ABC.es reports that many of the hopefuls had been waiting in line as long as twelve hours, setting up camp with beach chairs, sleeping bags, playing cards, and a lot of patience for the chance to be one of the first to enter. Some of the waiting was done in vain as anyone who wasn’t strictly brunette was turned away. Women with short hair, and anyone with visible tattoos were also declined. However, as casting continues tomorrow, those with blonde, highlighted, or colourful hair will have the opportunity to head home and dye their hair before trying again. 2,500 people will be chosen by Modexpor Casting after making it through the screening process by the end of tomorrow, but only 500 people will actually make it onto set in October, when Osuna and Sevilla will be home to Dorne and Meereen. Modexpor reports that all spots for men were filled today, with 400 spots for women remaining to be filled during tomorrow’s casting. Toome, Northern Ireland, was on lockdown today as filming for season 5 continued on the River Bann. One fan did manage to spot actors on the set, including Peter Dinklage and his counterpart from Lough Shore. Spoilers below! Edit: Dammit, I wasn’t fast enough. Hmmm. Sorrows? If they were doing a night shoot then that seems more and more likely. Ooooo! I hope so. Soooo creepy! I’m intrigued by how locked-down it sounds like they’re keeping the set…almost as if they’re trying to keep something secret. Of course, that may well just be my wishful thinking. I’m intrigued by how locked-down it sounds like they’re keeping the set…almost as if they’re trying to keep something secret.Of course, that may well just be my wishful thinking. But seriously, someone in a thread here yesterday mentioned there were “screens” up on the broken bridge, which I assume means green screens, which could be telling. Well, the Sorrows in the books were more than just a broken bridge, no? It was a whole abandoned/destroyed city. If they were going for that in the show it would require green screens. In any case, I doubt they were doing night shoots since those tweets were in the morning. That said, maybe they pumped the river up with fog and will do the rest with post-prod effects. Greyscale infection is going to happen, probably through Jorah. I’m glad that we are getting it because it will be amazing visually. And greyscale is a tragic but appropriate change to Jorah’s arc. Since Tyrion’s story in Essos seems to be radically changed, I wonder how/why he and Jorah get on this boat. Where are they headed? they passed twice being key? Is that where they got attacked? it is where they were attacked by the Stone Men. I friggin’ LOVED that part from the book and hope they’re really trying to bring that to life. Can we at least have a couple of companions with Tyrion though? Even just one or two. And there’s no way we’re getting Moqorro, I’m guessing. If the Stone Men and Jorah/Tyrion happen, I’m not sure why everyone is jumping ot the conclusion that Jorah has to get Greyscale! It is possible they just put it in because it’s a cool action scene and would develop a bond of trust between the two characters. If Jorah dies then I’m sure George has already got a suitably good way for him to go in stall. The voyage down the Rhoyne is the Heart of Darkness/ Apocalypse Now moment for ASOIAF, and I love it. Though it, and the Kingsmoot, are two of the very few things I appreciated (and remember) about the last two books. That voyage must have taken half the pages of adwd. I always thought that their Rhoyne journey through the Sorrows and under the bridge was a bit Escherian. It’s like the current of the river took them back to the same place near the bridge, like the famous Escher drawing of the water mill, before they were able to continue. Even after a re-read, I still am wondering what GRRM was trying to accomplish with that scene….a bit of lingering sorcery or unbroken spells from the days before the Doom perhaps? Btw, it’s about time that brunettes were preferred over blondes. Everything of Tyrion’s storyline that came after that, though… freak that, and I speak that as a person who learned to love Brienne’s travels. They almost certainly did, but people will try their luck anyway. has, then that’s a ridiculous decision IMO. Definitely? No. But many assume, for many reasons, that both Griff and Young Griff both have been cut. RG on Are Jon and Dany Doomed in Season 8 of Game of Thrones?